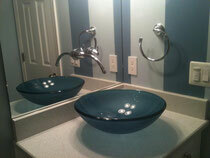 Plumbing Fixtures - Website of midwayplumbingservices! Midway Plumbing Services can handle all you fixture needs - From disposals installation to toilet repairs. If water runs through it, we'll do it! Repairs are only half the equation — sometimes you need something new installed or just want to upgrade to a more modern, contemporary choice. We specialize in repair and installation for bathroom and kitchen fixtures including bathtubs, disposals, faucets, sinks, shower pans, and toilets. Whether you need your bathroom and kitchen fixtures repaired or replaced, our friendly and skilled technicians are ready to help you. We can repair you're existing bathtub, disposal, faucet, sink, shower pan, tile, toilet or water heater, and when the time comes, we can replace any of these fixtures with leading products. If you want to skip any of our repair services, like our kitchen sinks repair services, you can go straight for a new installation to update the look of your home. Our team of experienced plumbing experts is ready to do any type of repair or installation you need.